Of you a favor asking am I. Backwards speaking am I. Totally channeling my Inner-Yoda. When I first started volunteering at DBSA Albuquerque, and when I first started attending Local Collaborative 2 meetings, ’round about the end of 2010 and the beginning of 2011, I met all sorts of cool people. Folks I recall being very impressed with are folks like Jay Crowe, Jim Ogle, and Chris Morris. These are folks who cared, and these are folks who had nary a nasty thing to say. What they said was encouraging and collaborative. I am now very intrigued by this supposed nefarious character and want to learn as much as I can about them independently. You know that person who pulled me aside to tell me not to be friends with that bad sort over there? Well, I don’t really want to get to know that person very much at all. As you can see, the manipulated result hoped for (that I will not work or collaborate with the supposed nefarious character) isn’t achieved. My curiosity is piqued, my sense of adventure is sparked, and my love of a challenge is engaged. What’s this guy about? How did he make people angry enough to generate “dire warnings”? Is this someone who can be a benefit to my advocacy goals? Inquiring minds want to know. My mind. Have at it. I mentioned Chris Morris earlier. Dr. Morris, when I met him at LC2, was working for Optum Health. He attended LC2 not in a voting capacity; his role was to be a resource and contact for community stakeholders with Optum, which was at the time the only MCO for Medicaid. Again, Chris earned my respect the first meeting because he is someone who is honest, forthright, and encouraging of others. He is someone who cares about our community, and he is someone who cares about people. Everyone has this capacity within them, and for Chris this is his “go to” place instinctually. Simply put, I like Chris as a person. 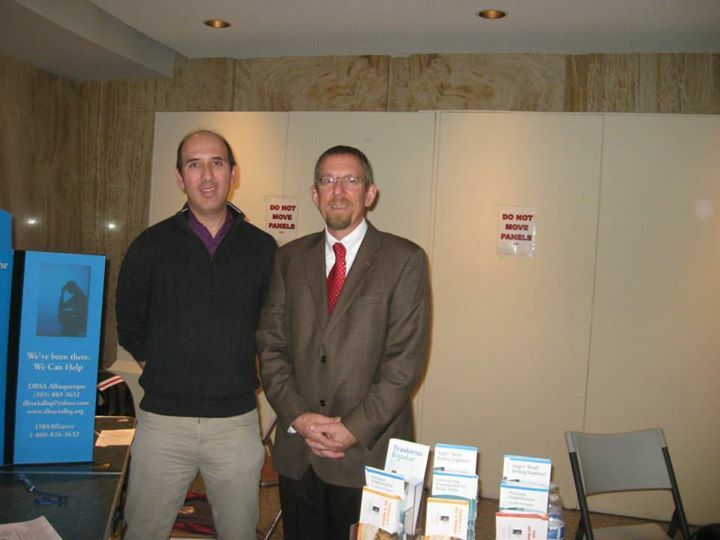 A few years ago DBSA Albuquerque was set up at Behavioral Health Day at the Roundhouse in Santa Fe. It was fun meeting new people (it always is for me), it was fun catching up with established friends (it always is for me), and it was excellent learning much more that happens on the state level with legislation and policies. This particular Behavioral Health Day had more poignancy beyond public education at the DBSA Albuquerque table. On this day Chris Morris shared something with me that has so influenced the direction and quality of my peer advocacy that I really want people to know and understand how important what he said is to me. “Steve, you are making some people very upset. They don’t like the way you advocate for peers. Think, though. What is it you’re trying to do? You want to help make the lives of peers better. So why would people be mad at you for that? I am unpredictable, and it’s best not to work with me at all. Dr. Chris Morris and I at Behavioral Health Day in Santa Fe. So this brings me back to a very core reason I don’t value other community stakeholders giving me advice of who to avoid and who to support. Whatever their qualms with the individual are, these are their personal qualms and are not values I will adopt without my own considerations – if at all. And what this means is I will determine for myself whether I can work with this supposed nefarious character or not, and I will afford this supposed nefarious character the opportunity to gauge whether they find me a worthwhile collaborator as well. Please don’t feel I don’t appreciate folks lending me the wisdom of their experiences, especially when it comes from someone whom I have learned to respect and honor their opinions, and this person has proven a worthwhile collaborator in my peer advocacy goals… and someone I call my friend because of who they are and what they mean. Quite often, their wisdom is something that is good information that I can consider incorporating into my dealings… minus the devaluation of another community stakeholder. And consider this: Just because you can’t work with this supposed nefarious character, our community cannot afford to miss the chance for two important stakeholders who can work together to combine resources and make an important, real difference. Look, the ledger checks in like this for me. I honestly, completely believe everyone has value and everyone has something to contribute to the world. I also honestly, completely believe everyone has earned a second chance, a third chance, a fourth chance, a fifth chance, a chancen+1. I know my bipolar symptomatic nonsense has been tolerated time and again, and for this I offer a humble thank you. Just let me have the opportunity to pay this kindness forward. And let me have the chance to get to know someone before telling me they’re a troublemaker. Heck, there’s a chance we’ll get in trouble together while making the world a more beautiful place. Heads up! Go long!